An explanation for the uninitiated: “Polestar Engineered” is like Mercedes’ AMG or BMW’s M brands, but for Volvo. Yes, once staid and conservative Volvo has not only become a lot more dynamic in recent years, but also has a performance division. Polestar was born and bread in motorsport, just like its German counterparts, and having already provided an assortment of go-fast models in previous generation S60 and V60 models, is now doing the same with Volvo’s updated lineup. Its most recent project was based on the 2019 Volvo S60, but the S60 T8 Polestar Engineered (as it was called) sold out before most of us even knew it existed. 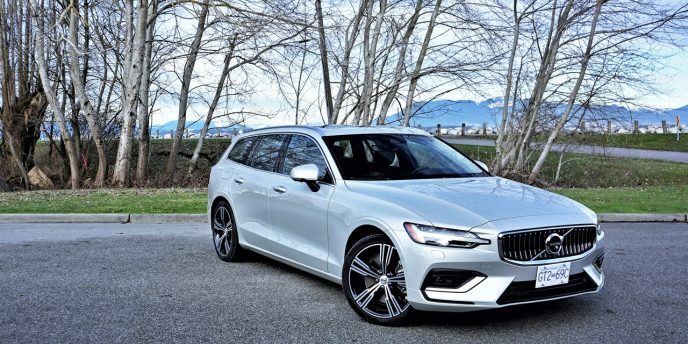 Now we have word from Volvo Canada’s Richmond Hill, Ontario office that new Polestar Engineered variants of the V60 sport wagon and XC60 compact crossover SUV are on the way for the 2020 model year, which should cause those in the know to get pretty excited. For starters, the new Polestar Engineered duo are once again based on Volvo’s turbocharged, supercharged and electrified T8 Twin-Engine Plug-in Hybrid AWD powertrain, which is sport-tuned to make 415 horsepower and 494 lb-ft of torque, 15 horsepower and 22 lb-ft of torque more than the regular T8 powertrain. Thanks to software updates, torque arrives earlier making throttle response quicker for more immediate response to input, while more of that twist targets the rear wheels for greater performance feel. To be clear, along with the boosted 2.0-litre four-cylinder, the T8 drivetrain combines an electric motor at each end of the vehicle for a total of two, while its battery pack is fed in both traditional hybrid form and via plug. Additionally, traditional Polestar gold-coloured six-piston Brembo calipers add stopping power, while lightweight 19-inch forged alloy wheels, unique on all three Polestar Engineered S60, V60 and XC60 models, have been designed to provide freer cooling to those upgraded brakes. Polestar Engineered models don’t receive the same level of visual stimulation as their aforementioned German competitors, which may help them slide under the radar both figuratively and literally, with styling enhancements including a high-gloss black grille, extended wheel arches, black chrome tailpipes, plus “discreet” Polestar badges front and back. Following a similar theme inside, the two Polestar models will get a special leather-clad sport steering wheel and shifter, metal mesh aluminum inlays, plus signature gold seatbelts over unique charcoal-coloured Nappa leather and “open-grid” textile upholstered seats. The V60 T8 Polestar Engineered and XC60 T8 Polestar Engineered will arrive as early 2020 models this summer, so if interested make sure to let your local Volvo retailer know. The compact luxury sedan market segment is a tough nut to crack. It’s more or less owned by three German makes, including Mercedes-Benz with its C-Class sedan, wagon, coupe and convertible, Audi with its A4 sedan and tall wagon, plus its A5 coupe, convertible and four-door coupe, and BMW with its 3 series sedan and wagon, plus its 4 Series coupe, convertible, and four-door coupe, leaving a bevy of smaller players fighting over scraps. To be clear, most in this class are suffering from the success of their own compact luxury crossover SUV making, which means that while year over year sales of the BMW X3, for example, were up by 48.6 percent from calendar year 2017 to 2018, deliveries of the iconic 3 Series were off by 19.5 percent, and much lower volume 4 Series sales down by 5.4 percent. Not every car in the D-segment lost ground, mind you, with the aforementioned C-Class gaining 6.5 percent, the Infiniti Q50 up 6.8 percent, and the Audi A5’s take-rate growing by an amazing 25 percent after a long-awaited redesign, but some saw significantly more shrinkage than BMW’s 3, such as Lexus’ RC coupe that dropped a staggering 37.9 percentage points, Jaguar’s XE sedan that lost 27.8 percent, Cadillac’s ATS sedan and coupe collectively down 25.4 percent, Acura’s TLX sedan off by 25.2 percent, Infiniti’s Q60 coupe down by 24.2 percent, and the Audi A4 sedan and tall crossover wagon’s popularity curtailed by a considerable 20.3 percent. Such steep sales declines make the Volvo 60-series’ loss of 5.1 percent seem easier to stomach, and to be yet farer to the Swedish automaker, those 60-series cars’ incredible 99.7 percent year over year increase from calendar year 2016 to 2017 made the slight downturn inevitable, the former upsurge directly resulting from years of pent-up demand for this all-new S60 sport sedan and its V60 sport wagon counterpart. The aforementioned tough nut to crack comment has less to do with sales volatility and more about actual sales numbers, however, with both 60-series Volvos only managing 1,245 units collectively through 2018, compared to 11,556 for the bevy of C-Class models, 10,173 for the various Audis, and 9,733 for BMW’s offerings—yes, the 3 Series/4Series was once number one in this segment. Everything else is much farther down the pecking order, with Infiniti’s sedan and coupe ringing up 3,424 orders, Lexus non-ES offerings (the IS and RC) tallying up to 3,163 deliveries, Acura’s previously noted TLX finding 2,397 buyers, and even Cadillac’s ATS scooping up 1,615 new owners (before it gets axed), while a fair ways below Volvo’s 60-series total was Genesis’ G70 at 967 units, Jaguar’s XE at 571, and Alfa Romeo’s Giulia at 510 deliveries. Now, before you scurry off to your local Merc, Bimmer or Audi store to sign up for one of their arguably worthy offerings, take note that earning a place in the top three doesn’t necessarily mean the car in question is better than something else on this list, or more specifically, doesn’t mean that something less popular won’t suite your personal style and requirements more agreeably. Case in point, this all-new 2019 Volvo S60. Volvo was once most notably known for safety above all, followed closely by bulletproof build quality. The good news here is safety is still high on the marque’s priority list, with its most recent offerings receiving Top Safety Pick and Top Safety Pick Plus ratings from the IIHS, plus its bevy of standard active safety and advanced driver assistance features amongst the most comprehensive in the industry, some including automatic front collision warning with full low- and high-speed autonomous emergency braking, Driver Alert Control, steering support, Run-Off Road Mitigation, plus a Lane Keeping Aid and Oncoming Lane Mitigation as part of its standard City Safety package, while Volvo also goes over the top by adding an airbag for the driver’s knees, front seat whiplash protection, and pyrotechnical seatbelt pretensioners in all positions front to rear. Also noteworthy, if the S60’s sensors detect an imminent head-on collision, the new oncoming braking system will automatically activate maximum braking force two-tenths of a second before impact. Volvo says this feature reduces vehicle speed by 10 km/h before that impact occurs, which could potentially be a lifesaver, and should certainly help to minimize injury. While tempted to do a deep dive into all of the additional standard features found on this 2019 S60, let alone our sporty R-Design trimmed example, I’d better go over some of its other highlights first. Most of the S60’s design details, like its “Thor’s Hammer” LED headlights have been covered in previous Volvo reviews, as have its C- or hook-shaped LED taillights that are similar, at least, to those found on the larger S90. I have to admit to liking the overall shape and design of the S60 best, but this may only be due to its newness, plus the sportiness of this R-Design trim level. In truth, I find both new sedans very attractive, at the very least matching and in many ways surpassing some of their key competitors. I won’t go into detail as to the size difference between these two cars, this S60 clearly fitting into the most popular compact luxury D-segment, and the S90 within the larger luxury mid-size E-segment (going up against the E-Class, 5 Series, A6, et al), but take note this S60 has grown considerably when compared to its 2010–2018 predecessor, now stretching 133 millimetres (5.2 inches) longer from nose to tail at 4,761 mm (187.4 in), with a 96-mm (3.8-in) longer wheelbase measuring 2,872 mm (113.1 in), but strangely it’s 15 mm (0.6 in) narrower at 1,850 mm (72.8 in), while sporting a 53-mm (2.1-in) lower roofline than the outgoing model. 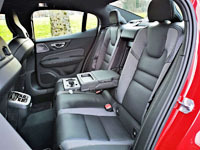 The longer wheelbase improves rear legroom, which critics charged as a shortcoming on the old S60, and I must say the rear seating area is now much more accommodating with plenty of space to stretch out and get comfortable, plus it provides superbly comfortable outboard positions with excellent lower back support. Such is even truer for the driver’s position, which in R-Design trim receives a six-way powered and wonderfully contoured sport seat with four-way powered lumbar support that allows ideal adjustment for the exact lower back pressure point, providing relief on long trips, or for that matter after a long day’s work, while a power-extendable lower cushion nicely cups below the knees for additional comfort and support. Two-way memory sets a favourite position for instant recall, this standard across the entire S60 line, while R-Design exclusive Fine Nappa leather upholstery with contrast stitching covers all seats from front to back, making for a luxurious look and feel. As attractive as they look I highly doubt your eyes will rest upon the seats at first entry, however, as the rest of the S60 R-Design’s interior is so spectacular you’ll likely be swept away by the elegant horizontal dash design and beautifully sculpted details everywhere else, let alone its three-spoke R-design leather-wrapped steering wheel, R-Design metal pedals, R-Design carpeted floor mats, R-Design metal sill mouldings, 12.3-inch digital gauge cluster, impressive vertical infotainment touchscreen with Apple CarPlay, Android Auto, navigation, four-zone automatic climate control with rear controls, etcetera, while the black headliner is a nice touch too. Still, the S60 R-Design’s special Metal Mesh decor inlays are particularly eye-catching, as is all of the S60’s jewellery-like switchgear, the rotating instrument panel knobs, glittering ignition switch, and equally dazzling drive mode selector appearing as if provided by one of the auto sector’s ultra-luxe brands, such as Bentley. Much of this glitz and glamour was initially introduced in the dramatically redesigned 2015 XC90 that formed the basis for most everything we’ve seen from Volvo since, so while the S60’s take on the Swedish automaker’s brand-wide interior design theme is nothing new to me or others familiar with the all things Volvo, the lavish luxury infused into each new 2019 model will likely produce eye-bulging levels of shock and awe amongst those trading up from their second-generation S60s. Expanding further on this line of thought, I previously spent three wonderful weeks in the V60 sport wagon, upgraded to top-line Inscription trim, which while slightly more expensive than the R-Design, in either V60 or S60 guise, is hardly more replete with features. Think of the Inscription as a more elegant take on luxury and the R-Design offering up a sportier edge, while the base Momentum is plenty impressive as well. Volvo should soon be offering the S60 in T8 AWD Polestar trims too, this model boasting the brand’s hybridized plug-in powertrain that ups performance to 400 horsepower and 400 lb-ft of torque via the same turbocharged and supercharged 2.0-litre four-cylinder as offered with T6 powered models. That thought segues into currently available powertrains, with both T5 FWD and T6 AWD combinations under the S60’s hood and at its wheels. The T5 FWD is solely available in Momentum trim, featuring the same 2.0-litre four without the supercharger for a healthy 250 horsepower and 258 lb-ft of torque driving the front wheels, while the T6 AWD is optional with Momentum trim and standard on the R-Design and Inscription, and thanks to the aforementioned supercharger joining the turbo, it makes a much more satisfying 316 horsepower and 295 lb-ft of torque while powering all four wheels. As is normally the case in this class, both engines come standard with auto engine start/stop that reduces emissions while improving fuel economy by shutting down the engine when it would otherwise be idling, this helping the base T5 FWD to achieve a claimed 9.9 L/100km city, 6.6 highway and 8.4 combined rating, whereas the as-tested T6 AWD is good for an estimated 11.1 city, 7.3 highway and 9.4 combined. Possibly more important to you is how the S60 R-Design drives, and to that end it’s even more dynamic than the V60 Inscription I enjoyed over the holiday season. It’s plenty quick off the line, with all four of its optional 235/40R19 Pirellis immediately locking onto asphalt and its formidable little powerplant whipping through its conjoined eight forward gears with effortless ease, both quickly when set to its sportiest Dynamic drive mode, and smoothly no matter which selection is chosen, Comfort and Eco also on the menu, while the R-Design model’s standard paddle shifters thoroughly enhance the hands-on experience. The engine and exhaust makes a nice snarly combination of notes at full throttle as well, but otherwise is as hushed as the car’s ultimately refined interior, the S60 R-Design balancing performance and pleasantries on an equal scale. Similar kudos can be attributed to the S60’s underpinnings, the R-Design’s exclusively lowered sport suspension boasting firmer dampers for tauter, flatter handling through fast-paced corners that results in stable, predictable manners even when flung carelessly into tight off-camber curves, while it doesn’t get unsettled when tossed back and forth through serpentine stretches either. It rides on the same Scalable Product Architecture (SPA) that Volvo uses for its larger S90 luxury sedan chassis, plus most everything else in the brand’s current lineup, with aluminum double wishbones in front and an exclusive integral link rear suspension design featuring a transverse lightweight composite leaf spring at back. Driver-selectable low, medium and high personal power steering settings combine with the aforementioned driving modes to make the most of any situation, whereas the brakes match handling and acceleration ideally as well, proving strong when called upon and always smoothly progressive, the entire car never forgetting that, while a capable sport sedan, refined luxury, supported by a compliant suspension setup and ultra-comfortable seats, is paramount in the class. To that end the $52,400 S60 R-Design, which normally rides on 18-inch alloys, pulls plenty of as-yet unmentioned features up from the $42,400 base Momentum T5 FWD model, such as Road Sign Information (RSI), an auto-dimming rearview mirror, rain-sensing wipers, a powered panoramic glass sunroof, a Clean Zone Air Quality system and a humidity sensor, rear parking sonar, a rearview camera with dynamic guidelines, voice activation, dual USB ports, Bluetooth phone connectivity with streaming audio, Volvo On-Call with remote start and vehicle tracking, 170-watt 10-speaker audio, satellite radio, heated front seats with driver’s memory, a 120-volt household-style power outlet in the rear console, power-folding rear seat headrests, and more inside, while standard dual chromed tailpipes are joined by a unique R-Design front grille, plus auto high beams and active bending for the aforementioned LED headlamps, fog lamps with active bending, high-gloss black exterior trim including the side mirror caps, door handle puddle lamps, proximity-sensing keyless access, and the list goes on. I loved my tester’s $900 optional Fusion Red Metallic paint, one of five optional colours as well as no-cost standard Black Stone, while all R-Design models get Charcoal black for the interior. 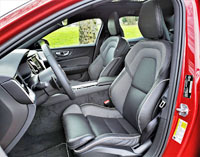 If you end up going for Momentum trim you can choose from seven exterior colours and a variety of interior motifs, while Inscription trim provides the choice of eight colours albeit fewer cabin combinations, although the Momentum’s upgradable upholsteries are optional at no cost with the Inscription. Those 19-inch alloy wheels mentioned before were a $1,000 upgrade, while additional options included a $1,150 graphical head-up display unit that projected useful information, like navigation directions, onto the windshield for an easy, safe overview, plus the 15-speaker, 1,100-watt Bowers & Wilkins audio system was soundsational, and well worth the $3,750 required, even if you choose it for its gorgeous aluminum speaker grilles alone. 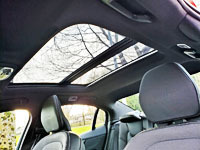 Volvo also added a $1,250 Climate Package that features heated Aquablades windshield wipers, a heatable steering wheel, and heated rear seats; plus a $1,500 Convenience Package with Volvo’s really impressive Pilot Assist semi-autonomous drive system featuring Adaptive Cruise Control, plus a Homelink garage door opener and a compass integrated into the rearview mirror; and finally an $1,800 Vision Package with very helpful 360-degree surround parking camera, easy to use Park Assist Pilot semi-autonomous self parking, always welcome front parking sonar, even more appreciated auto-dimming power-retractable side mirrors, and blindspot monitoring with rear cross traffic alert that could potentially save you from backing into oncoming traffic. In case you were wondering, the $53,900 S60 Inscription includes most everything from the R-Design, other than the sportier features mentioned earlier, while in their place it adds a classy chromed waterfall grille, chromed window trim, unique 10-spoke 18-inch alloy wheels, beautiful matte Driftwood Décor interior inlays, a tailored instrument panel with stitched soft-touch detailing, perforated Nappa leather upholstery, ventilated front seats, and more. 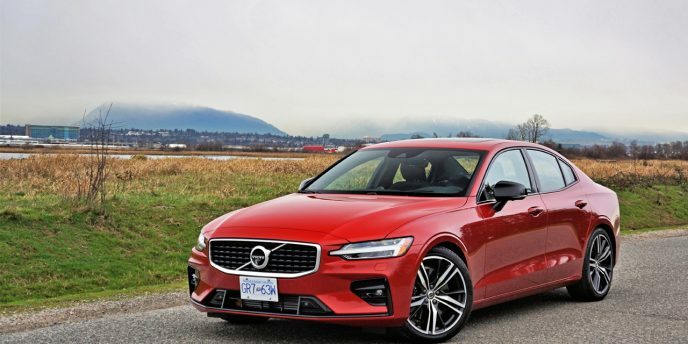 I sourced all 2019 Volvo S60 pricing from CarCostCanada, incidentally, where you can find detailed prices on each trim level, all packages, and every standalone option for the S60 and every other Volvo, not to mention most other new vehicles sold in Canada, plus otherwise hard to get rebate information and money-saving dealer invoice pricing. My only S60 complaint is a missing overhead sunglasses holder, plus not enough space on the centre console to place my average-sized Samsung S9 smartphone within easy visibility while driving, which was probably planned from onset by this safety-conscious automaker so as to reduce distracted driving. The most forward of two large cupholders, otherwise hidden below a lovely scrolling console lid, solved that problem, with the latter big enough to hold my ever-present water bottle securely, no matter how aggressively I took to corners. The S60’s 391-litre (13.8 cubic-foot) trunk was also large enough for my needs and about average for the class, and while its 60/40 split-folding rear seatbacks included a centre pass-through for skis and other long cargo, I would have preferred a larger opening via a 40/20/40 divided seat configuration instead, but this is still a lot better than no pass-through at all, which is how most Japanese offerings come. In closing, anyone considering a car in the compact luxury D-segment should take a close look at this new 2019 Volvo S60, as it’s a serious contender that delivers at an extremely high level in every way, from styling to performance, leading technology to safety, and overall comfort to accommodating spaciousness. Also important, it’s wonderfully different than anything from Germany or Japan, and for that reason the S60 may very well strike a chord with those who especially appreciate uniqueness and exclusivity, let alone a level of opulence few in this class can measure up to. I won’t go into all standard and optional features available with base Momentum or $55,400 Inscription trim, although if interested feel free to check out my previous story that covered everything in detail, so suffice to say the latter as-tested model gets a special chromed waterfall grille, cornering headlights, fog lamps, a really nice leather-wrapped and metal edged key fob, Power Steering Personal Settings with low, medium or high assistance, the gorgeous Driftwood decor inlays, digital gauge cluster and four-way powered lumbar noted earlier, Nappa leather upholstery that’s perforated for allowing through forced ventilation up front, etcetera. And by the way, all 2019 Volvo V60 pricing was sourced from CarCostCanada, where you can find detailed pricing on trims, packages and standalone options for every other new vehicle sold in Canada, plus otherwise hard to get rebate information and dealer invoice pricing that could save you thousands. Hey wagon lovers! Take a look in our garage this week. This is the entirely new-from-the-ground-up 2019 Volvo V60 in top-line Inscription T6 AWD trim, which means that it looks fabulous, comes filled with all of Volvo’s latest non-plug-in tech, and is one luxurious family hauler. It’s also really roomy. In fact, we think the new V60 is targeting previous V70 customers just as much as those who loved the outgoing V60, thanks to a substantive 124-mm (4.9-inch) greater length overall, plus a 9.6-mm (3.8-inch) longer wheelbase that results in the most spacious rear seating area in the luxury D-segment. The new model is 51 mm (2.0 inches) lower than its predecessor too, which adds to its long, sleek visual stance, but nevertheless it provides ample headroom and legroom for a six-foot passenger behind a six-foot driver, or so reports claim, while the new V60 also boasts 20 percent more cargo room than the outgoing car. The new V60 sits atop the same Scalable Product Architecture (SPA) chassis architecture that underpins the larger V90 sport wagon, not to mention everything else in today’s Volvo lineup other than the compact XC40 crossover that utilizes the brand’s new Compact Modular Architecture (CMA) platform, which incidentally will support a new 40 series line of cars in the near future. SPA and the models built upon it have been widely praised by auto critics like us and Volvo customers alike, while sales of new Volvo products have been skyrocketing since the brand’s transformation that started with the second-generation XC90 SUV back in 2015. We’re not expecting this V60 sport wagon to sell anywhere near as well as that XC90 mid-size SUV or the more recently introduced XC60 compact crossover SUV, or for that matter the new V60 Cross Country that adds a little more off-road flair via the way of a raised suspension and rugged looking matte black body cladding, but the regular V60 should provide more road-hugging handling prowess, which we’ll report on later in our upcoming road test review. Big sales or not, the V60 supplies a major dose of Volvo DNA to the entire brand. After all, Volvo has had a wagon in its lineup longer than most people can remember, and now that the larger V90 has been slated for cancellation in Canada (it was only ever available via special order in the U.S.), availability of this V60 is critical for keeping up the Swedish brand’s pragmatic image. Pragmatic yes, but sitting down inside replaces any such practical thoughts with feelings of pampering hedonism, being that the 2019 V60 continues Volvo’s new brand ethos of providing more luxury than any rival. We won’t tell you all of our experiences yet because we’ve only taken delivery of the car and haven’t even written our notes down, but being that it looks much like everything else from the Swedish carmaker we’re expecting to find more soft-touch surfaces, satin-silver trim, jewellery-like detailing, and genuine hardwood inlays than rivals from Germany, Japan or the U.S., while Volvo’s electronic interfaces are some of the best in the business, from its standard 8.0-inch digital driver display within the gauge cluster to the optional 12.3-inch version of those same primary instruments, not to mention its standard 9.0-inch tablet-style Sensus centre-stack touchscreen. Volvo’s Sensus touchscreen has become our go-to example of how to do infotainment systems correctly, thanks to incorporating one of the most user-friendly and feature-filled interfaces in the auto industry. The new V60’s boasts 50 percent faster processing speeds than previous iterations used in other models resulting in quicker startup, faster response from the backup camera, much improved voice activation, and speedier navigation route calculation. The standard backup camera includes dynamic guidelines and graphics for the standard rear parking sensors, while other standard functions include Apple CarPlay and Android Auto smartphone integration, 4G LTE in-car Wi-Fi, a 10-speaker 330-watt audio system, satellite radio, a four-year subscription to Volvo On-Call that features remote start and vehicle tracking, and lastly two standard USB charging ports. The base 2019 V60 Momentum T5 FWD starts at just $43,900 plus freight and fees, which is only $50 above than last year’s base V60 despite its all-new design and upgraded everything, including those aforementioned “Thor’s Hammer” LED headlamps. Additional standard features include 18-inch alloy wheels, metal door sill treadplates, rain-sensing wipers, a powered panoramic glass sunroof, an auto-dimming rearview mirror, a three-spoke leather-wrapped multifunction steering wheel, dual-zone automatic climate control with a Clean Zone Air Quality system and a humidity sensor, unique Iron Ore decor inlays, Moritz leather upholstery, power-adjustable heated front seats with two-way powered lumbar support and driver’s memory, a 120-volt household-style power outlet in the rear console, a powered liftgate, power-folding rear seat headrests, power-folding rear seatbacks with controls in the cargo compartment, a semi-automatic cargo cover that conveniently slides up and out of the way when opening the tailgate, a metal cargo scuff plate, black integrated roof rails, dual chromed tailpipes, and more. This being a Volvo means plenty of safety gear comes standard too, so therefore all 2019 V60 trims get City Safety automatic front collision warning with full low- and high-speed autonomous emergency braking, plus Driver Alert Control, steering support, Run-Off Road Mitigation, Lane Keeping Aid and Oncoming Lane Mitigation, as well as all the usual active and passive safety features including an airbag for the driver’s knees, front seat whiplash protection, and pyrotechnical seatbelt pretensioners in all positions front to rear. 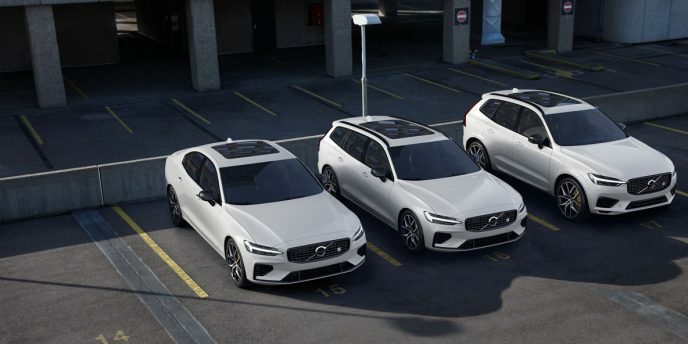 Of special note, the 2019 V60 introduces a new Oncoming Braking system to the entire Volvo lineup, which if sensing an imminent head-on collision will automatically actuate maximum braking force two-tenths of a second before impact. This is said to reduce vehicle speed by 10 km/h ahead of an impact, which could potentially be a lifesaver and certainly help to minimize life-altering injury. Momentum trim is available with the choice of two powertrains, the first being the T5 FWD that consists of Volvo’s well-proven 2.0-litre direct-injected and turbocharged engine, good for 250 horsepower and 258 lb-ft of torque, and the second the T6 AWD that costs an additional $4,000 for a total of $48,900 yet adds a supercharger to the turbocharged four-cylinder resulting in 316 horsepower and 295 lb-ft of torque. The former allows for a zero to 100km/h sprint of 6.6 seconds and a top speed of 225 km/h (140 mph), whereas the latter cuts standstill acceleration runs down to 5.7 seconds and ups maximum velocity to 249 km/h (155 mph). Both use a quick-shifting and highly efficient eight-speed “Geartronic” automatic transmission with manual mode to transfer power to the drive wheels. The new V60 can also be had with available Drive Mode Select that includes Comfort, Eco, Dynamic sport, and Individual driving modes, while fuel-saving and emissions-reducing automatic start/stop, that shuts the engine off when it would otherwise be idling, comes standard. The V60’s official Transport Canada fuel economy rating are 10.2 L/100km in the city, 6.8 on the highway and 8.7 combined for the T5 FWD, or 10.9 city, 7.7 highway and 9.5 with the T6 AWD, which puts it right in the hunt for top efficiency within the ultra-narrow niche known as the compact luxury D-segment wagon category. To be clear, the V60 is only up against the BMW 3 Series Touring, the least efficient 2018 model of which bested the most economical V60 by a very slight margin, while turbo-diesel and plug-in hybrid variants were even thriftier, for a price (most expect the 2019 3 Series to be even more of a fuel miser, although they haven’t shown a Touring version yet), whereas the all-new 2019 Mercedes-Benz C-Class Wagon only comes with one engine and driveline so far with no fuel economy specifics yet announced. The V60’s Dynamic Chassis is comprised of aluminum double wishbones up front and an exclusive integral link rear suspension design featuring a transverse lightweight composite leaf spring, Volvo promising both a comfortable ride and sporty handling from this fully independent setup that we’ll report on in our upcoming review. Being a niche model within a shrinking non-crossover/SUV category there aren’t any adaptive suspension options, but those choosing base Momentum trim can swap out the standard Charcoal (black) or Blond (beige) leather upholstery with sharp looking $400 City Weave plaid textile inserts in either colour, while standard Black Stone or Ice White exterior paints can be upgraded to one of nine $900 metallic finishes. Additionally, a set of $1,000 18-inch five Y-spoke diamond cut alloy wheels can be added too, while individual options include a $250 Charcoal headliner, $1,150 graphical head-up display unit, and $1,200 14-speaker, 600-watt Harmon/Kardon audio system. Momentum buyers can also add a $1,250 Climate Package that includes heated Aquablades windshield wipers, a heatable steering wheel, and heated rear seats; a $1,500 Convenience Package with Volvo’s advanced Pilot Assist semi-autonomous drive system featuring Adaptive Cruise Control, plus a Homelink garage door opener and a compass integrated into the rearview mirror; an $1,800 Vision Package with a 360-degree surround parking camera, Park Assist Pilot semi-autonomous self parking, front parking sensors, auto-dimming power-retractable side mirrors, and blindspot monitoring with rear cross traffic alert; and lastly a $3,400 Momentum Plus Package incorporating dynamic cornering headlamps, headlight washers, fog lamps, proximity-sensing keyless access with a hands-free tailgate function that lets you open the liftgate by waving a foot below the rear bumper, the aforementioned 12.3-inch digital instrument cluster, Drive Mode Select, four-zone automatic climate control, navigation (that lets the cruise control access map data for adjusting vehicle speed through corners when appropriate), Road Sign Information, and more. If you opt for the T6 AWD, all of the same standalone options and packages remain, except for wheels that start with a unique set of open-spoke 18-inch alloys as standard equipment and can be upgradable to a set of $1,000 19-inch alloys, while special Amber caramel brown leather becomes an interior option. Moving up to $55,400 Inscription trim adds the T6 AWD powertrain as standard equipment, plus a unique chromed waterfall grille, bright metal integrated roof rails, unique 10-spoke 18-inch diamond cut alloy wheels, fog lamps, cornering headlights, a special leather-wrapped and metal edged Inscription key fob, low, medium or high steering assistance via Power Steering Personal Settings, Driftwood decor inlays, the 12.3-inch digital gauge cluster, perforated Nappa leather upholstery, four-way powered lumbar support, ventilated front seats, and more. Option out a V60 Inscription T6 AWD and you can have special $1,000 19-inch multi-spoke alloys, the aforementioned Charcoal headliner and graphical head-up display, as well as a $3,750 19-speaker 1,400-watt Bowers & Wilkins audio upgrade, and $1,300 massaging front seats. The Momentum Plus Package is no longer offered due to most of it being standard in Inscription trim, but the three remaining Climate, Convenience and Vision packages are still available. While Momentum and Inscription are the only two trims currently available, we’d like to think that a sportier V60 R-Design will arrive at some point in the near future, which we’d hope would add special 18-inch alloy wheels with the option of unique 19s, plus steering wheel-mounted paddle shifters, and slightly edgier interior and exterior design, while it would incorporate most of the same features offered in the Inscription. Likewise, we hope the V60 will also be available with Volvo’s T8 Twin-Engine powertrain that uses a plug-in hybrid drivetrain to increase engine output to 400 horsepower while reducing fuel consumption considerably. Additionally, the outgoing V60 was also available in factory-built Polestar trim, a car we covered in 2017 guise right here. This was a fabulous performance, so needless to say we’d love to see something similar recreated for this all-new V60.